Russia remains in violation of the 1987 Intermediate-Range Nuclear Forces (INF) Treaty for the third year in a row, according to an annual State Department report released on April 11. Nevertheless, one high-ranking State Department official expressed optimism that Russia and the United States could make progress this year toward resolving the issue. As in the 2014 and 2015 reports, this year’s report did not specify the type of Russian cruise missile in question, the number of tests conducted, or the location of the tests. Defense and State department officials have said they do not believe Russia has deployed the prohibited missile. Gottemoeller did not elaborate on the reasons for her optimism. Meanwhile, the compliance report also registered concerns about Russia’s compliance with the 1992 Open Skies Treaty. The report said Russia “continues not to meet its treaty obligations to allow the effective observation of its entire territory.” In addition, the report said that Russia in 2015 refused to allow Ukraine to overfly its territory “unless Ukraine paid for each flight in advance.” This “could be the basis for a violation determination” by Ukraine, the report said. The Open Skies Treaty, which entered into force in 2002, permits each of the agreement’s 34 states-parties to conduct short-notice, unarmed reconnaissance flights over the others’ entire territories to collect data on military forces and activities. Separate from the compliance concerns, some U.S. military officials and intelligence officials appear to be opposed to Russia’s request in February to end the use of older wet-film cameras on flights over the United States and instead use a more advanced digital optical sensor to collect data. Although the upgrade to digital equipment is allowed under the treaty, the concern is that the use of the more advanced cameras and sensors would greatly increase Russia’s ability to collect intelligence on critical military and civilian infrastructure. The United States has yet to transition to the use of the more advanced digital sensors in its treaty flights over Russia, but plans to do so in the near future. 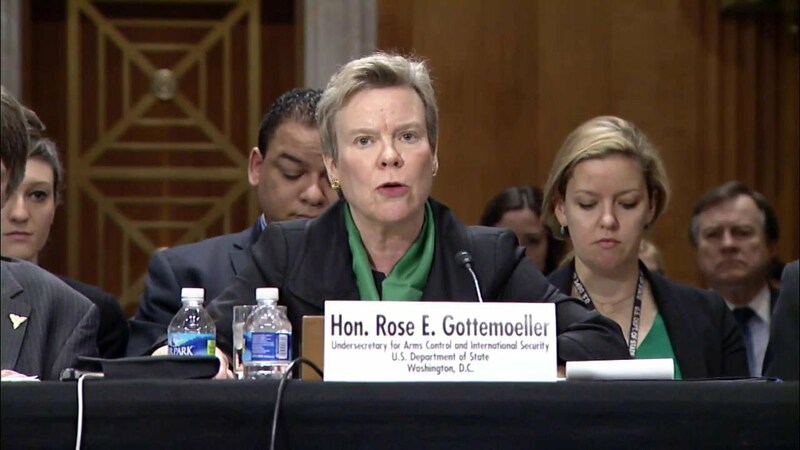 Gottemoeller told lawmakers at the March 17 hearing that she has “a somewhat different view of the utility of the treaty” than Stewart does. “I do want to stress that the Open Skies Treaty is an arms control treaty with a larger set of goals and purposes, among them confidence building, mutual confidence building,” she said.